Today we are the epitome of the cliche that says Canadians need their costumes to fit over a snowsuit. It is very cold, and a light snow is falling. Only in Canada, eh? Appliqué Outside The Box - Literally! and raw edge appliqué with no seam allowance if you wish to add a lining. 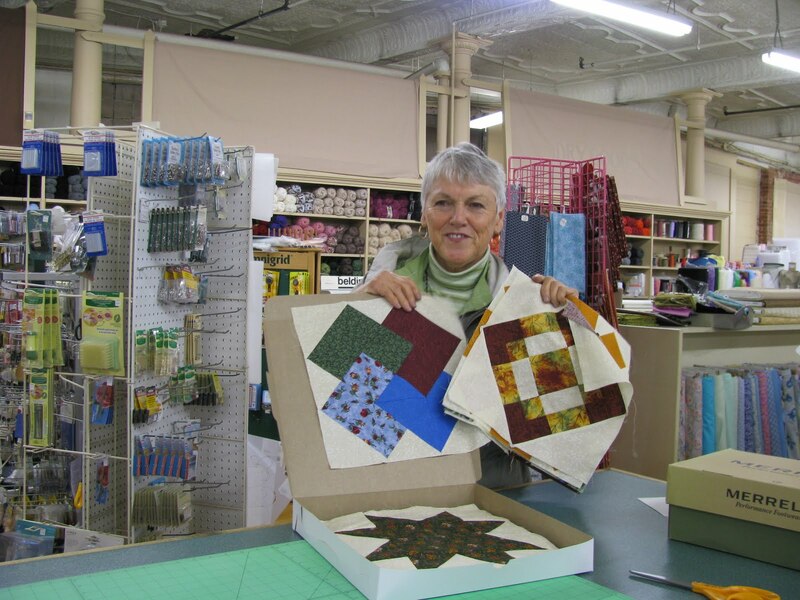 In our current trend of make-do and recycle, these really quick to make fabric gift boxes fit the bill nicely as fabric scraps left over from quilts may be used. The first task is to assemble suitable boxes for covering. Boxes come in all shapes and sizes and with a little ingenuity most can be successfully appliquéd. My favourite ones to use are those with flaps which fold in to form the box lid, rather than those with a separate lid. Look in your cupboards (or browse Sobeys!) and you’ll see all kinds of interesting boxes. Here are Wong Wing Chinese take out, Little Debbie cookie boxes, and an octagonal one for Compliments Sensations Pulled Pork Burgers. I admit some of this food I have purchased just to get the box…My boys haven’t yet made the connection that when I have a pair of socks needing a gift box, there are Swiss Rolls in the cupboard that week. The two boxes to be covered in this tutorial are a Tetley Tea and a Wong Wing frozen entrée box. The fabric is from Nancy Halvorsen's "Tidings" collection by Benartex, which is in stores now. It took less than an hour to complete both boxes. Basically, the cardboard boxes are opened flat and covered with fabric in the same way we work appliqué around a template. Fusible web secures the fabric to the box. 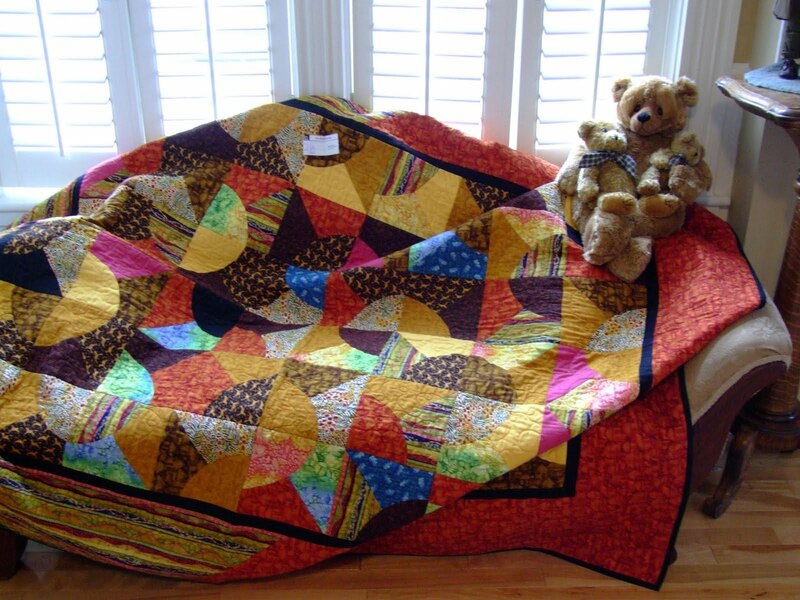 Once you have decided on a box, additional materials required are: fabric (large enough to accommodate your box, plus seam allowance), fusible web (the same size as your fabric), a hot iron (preferably with steam capabilities) and double sided tape or a hot-melt glue gun. I chose Steam A Seam 2 fusible web for this project as it is a bit thicker than some others. For those who attended my machine appliqué workshops during the Fibre Arts Festival earlier this month, the wooden applicator tool from your kit comes in very handy for turning the edges. Open up the box by gently coaxing the flaps apart and trace around the edges on the paper side of your fusible web. Roughly cut the fusible web approximately 1/2" past your traced lines and fuse it to your fabric. Cut your fused fabric approximately 1/4” past drawn lines. Clip into curves exactly as you would if you were doing turned edge appliqué. Removing backing from fusible web as you go, lay printed side (outside) of box on top of sticky side of fabric. 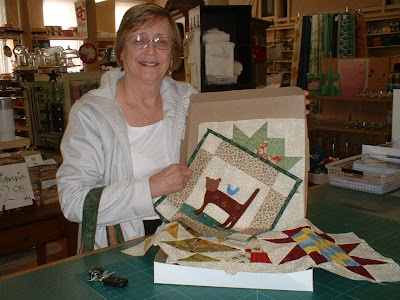 Pat down, and turn edges under just as in appliqué using that nifty wooden tool. When it’s all smooth, flip the box over and steam press the fabric in place. For the lining, remember that it needs to be traced in reverse – so flip the box over when tracing the lining on the fusible web. Cut shape out roughly - as above - and fuse to back of lining fabric. Cut approximately 1/8” inside your traced line. Lay lining in place to test for fit. Trim as needed to ensure it does not show on the outside of the box, remove paper backing and fuse in place. To reassemble your box, press along original scored lines on cardboard. Fold back into shape. Secure using either double sided clear tape or hot melt glue between the flaps. If desired, before reassembling you may add appliqués to decorate your box. 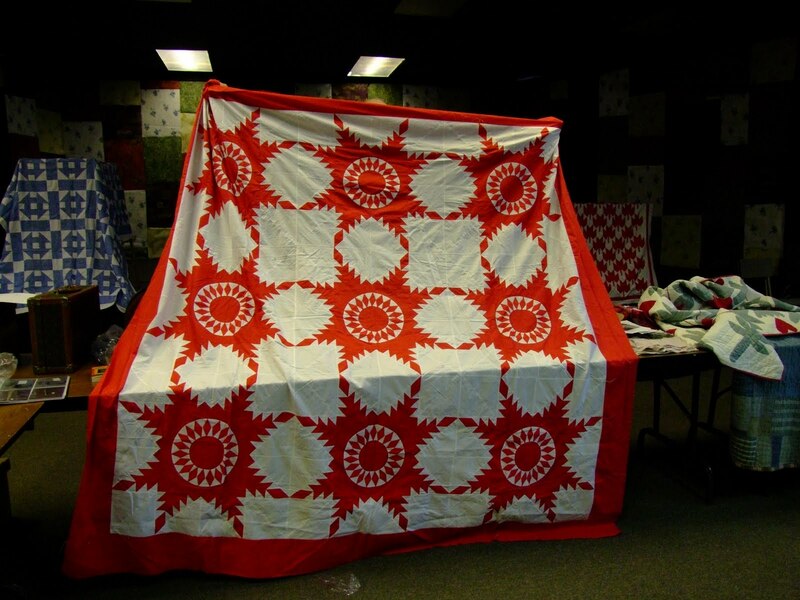 Apply fusible web to back of motif fabric, and cut out desired motifs. Open box out flat and fuse appliqués in place on box sides. Reassemble box as above. Yo-Yo's make a great decoration for your boxes also. Simply trace a circle on your fabric, cut out, turn under 1/4" and hand stitch the hem using a long basting stitch. Pull up the threads and knot the thread to hold your circle. I traced around the outside of a roll of masking tape to create these large yo-yo's, which measure 1-1/2" across when finished. And that's all there is to it! It's up to you to decide if these are boxes for holding gifts, or if the boxes ARE the gifts (much like James Thurber's Container For The Thing Contained conundrum *-). 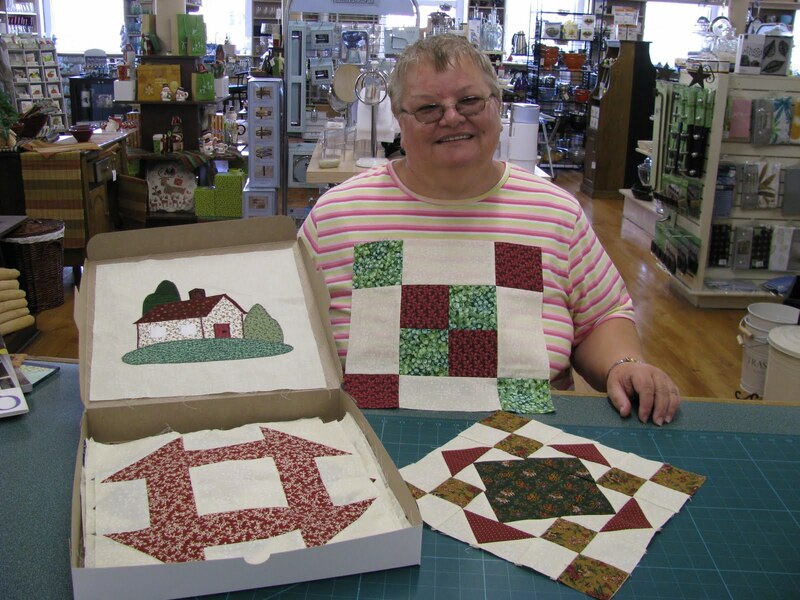 Either way, it's a quick and easy way to create a "quilty" Christmas gift. If you have enjoyed this tutorial, kindly leave a comment at the bottom of this post. We'd love to see pictures of any you make, just email them and they will be shared on this blog. Frosty nights are definitely upon us here in the Maritimes and the trees are turning glorious colours. These are sugar maples lining the road in Fenwick, just outside of Amherst. In the spring, there are several maple sugar camps located in this area. The change of season is evident in the beeyard also. The hives, which are normally a buzz of frantic activity, are very quiet. The bees move slowly and very few are flying around. No smoker was required today as everyone was so docile. Hubby built new hive-top feeders for each colony. These hold sugar syrup to feed the bees through the fall until they are wrapped for the winter. It was cold work on this chilly day and our hands were ice cubes when we finished. A stop for coffee at Tim Horton's gave us something warm to hold onto for the drive home. I love it when folks send pictures of projects they've made from my patterns! Here's a Selvedge Tote made by Sheralyn from Rockport, Texas. 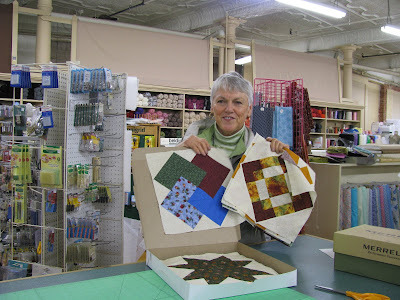 Sheralyn had a really colourful batch of selvedges from which to work. Last week at the Wednesday workshop, Sheila S. arrived with one too ...but I neglected to take a picture. If you'd like to make your own, the pattern is available from the checkout on my website or at any shops carrying Sew Karen-ly Created...designs. 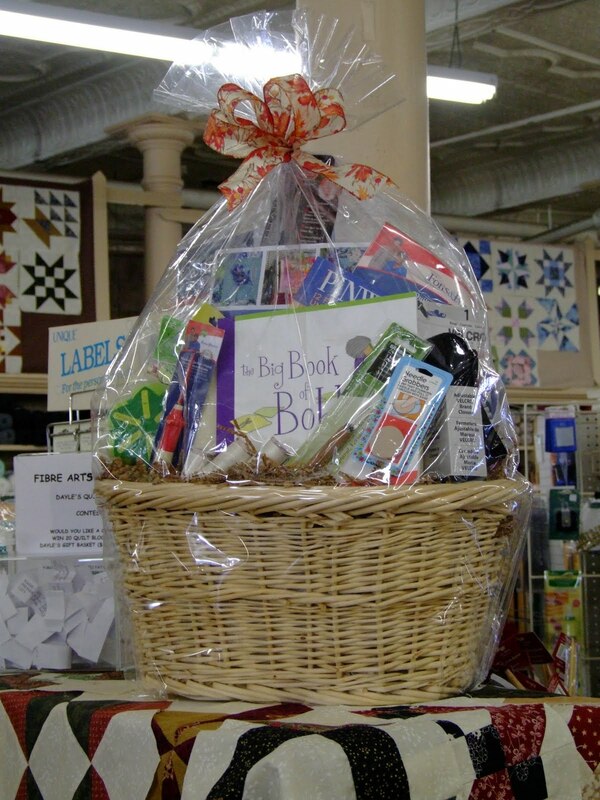 The winner of this gorgeous basket of goodies from dayle's Department Store is... (drum roll, please) ... Karen Reid! Here's Doreen, the manager of the Dry Goods Department, congratulating Karen on her big win. You can see all of the blocks entered in an earlier post here. The grand finalé of the 2010 Nova Scotia Fibre Arts Festival was held Saturday afternoon at Tantramar Theatre and it really was a special ending to an incredible week. Quilt collector John Corey from Havelock, New Brunswick gave a lecture and exhibit from his extensive collection of heritage domestic quilts. I enjoyed the drama, wit and suspense of his presentation a great deal, including the intriguing title he chose for his talk...the details of which he left to the very last. 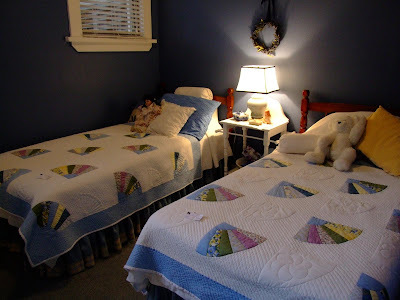 He had his quilts arranged on tables in an L shape around the room, folded right sides in, so that we didn't see the pattern on the quilts until each was shown. Front and centre on the main table was a lone Louis Vuitton suitcase which he told us held his prize possession. Naturally, he tantalized us by skipping past that case when he came to it, leaving it unopened almost until the end of the program. It was great! Mr. Corey was happy to allow photographs be taken of his textiles. One of my favourites of the show was this gorgeous Feathered Star design. John and I discovered we both have a penchant for red and white quilts, and he had many samples accompanying him as proof. 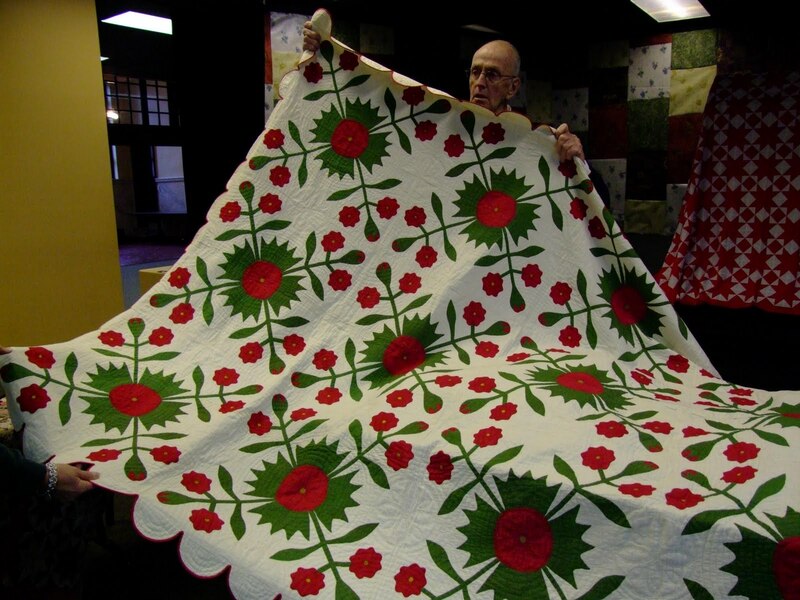 You can see one of his maple leaf quilts in the background (he brought an appliquéd version as well). He spoke of this exquisitely rendered Oak Leaf and Cherry pattern as being a "masculine" design, something I had never considered before. The small, hand-pieced star units in this quilt made it a stunner for sure. 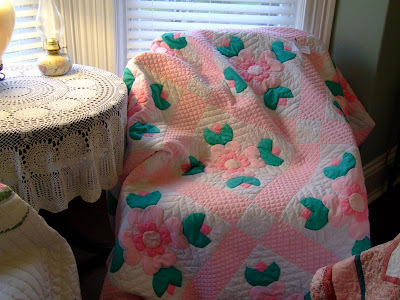 ...held up this magnificent whig rose quilt. It is impossible to get the impact of this fine piece of needlework from a photograph but it was stitched by a very skilled hand, and is in pristine condition. There was nothing thick or clumsy about this quilt: the fine cotton used front and back was an exceptionally high thread count, the batting very thin, and the stitches excruciatingly tiny. As soft as butter, it was a haptic delight and the proportion of the materials and workmanship was exact. The scalloped edge was finished in a very narrow bias binding, and the sharp inner corners were flawlessly turned. 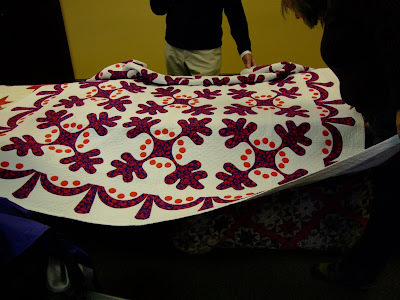 I grew so much in my knowledge and appreciation of fine quilting from seeing this lovely piece. Coincidentally, this quilt and many others in John Corey's collection have been appraised by Diane Shink, the co-author of our book Canadian Heritage Quilting. 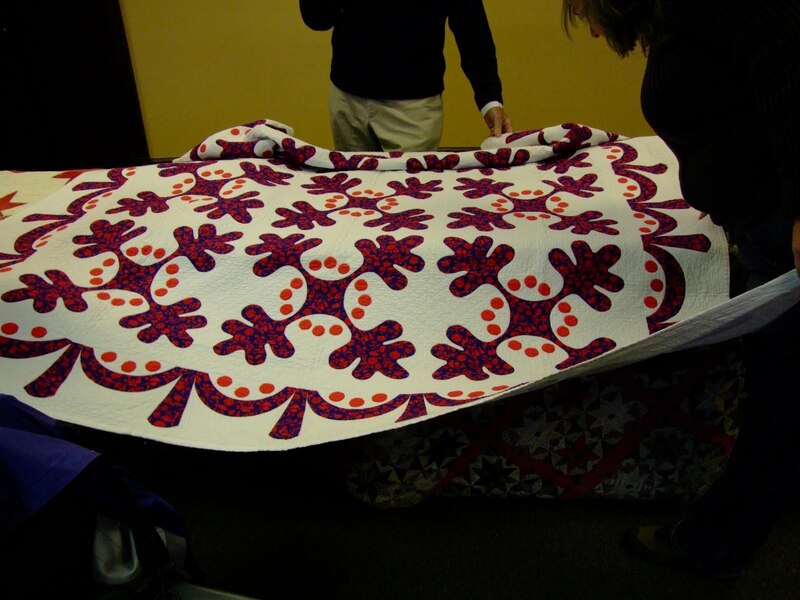 This quilt is the jewel in the crown of John Corey's collection, but had no connection to the enigmatic title of his lecture. You will have to attend his next presentation to learn what that was about. While the Fibre Arts Festival was taking place in Amherst, N.S. 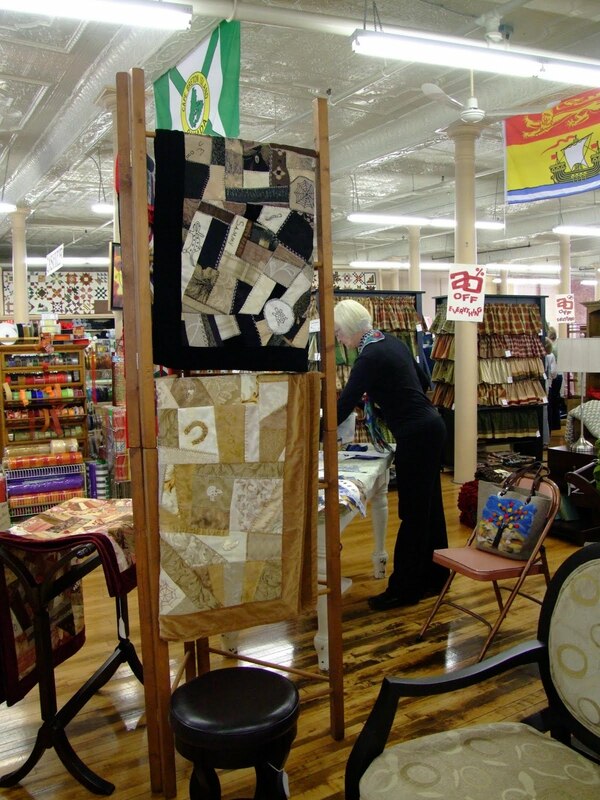 further down the east coast, Cooperstown, N.Y. was hosting a quilt exhibit entitled A New York State of Mind. I blogged about this earlier when my quilt Tropical Farrago was juried in as a finalist. 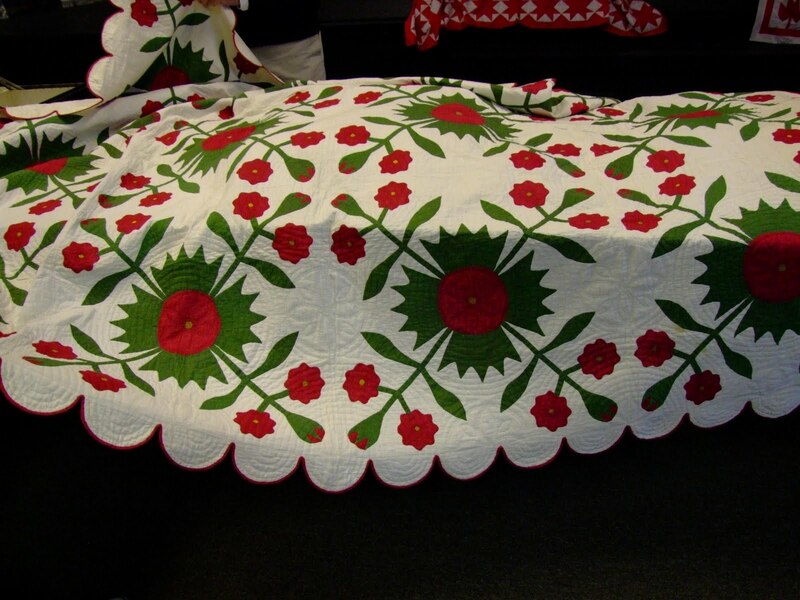 Sponsored by the New York Historical Society, the exhibition held at the Fenimore Art Museum/Farmer's Museum was made up of quilts from traditional blocks...such as the New York Beauty. The list of finalists is posted on the museum website; I appear to be the only Canadian in the group. If any readers of this blog were in attendance at the show, I'd love to have copies of any pictures you may have taken. You can email me here. 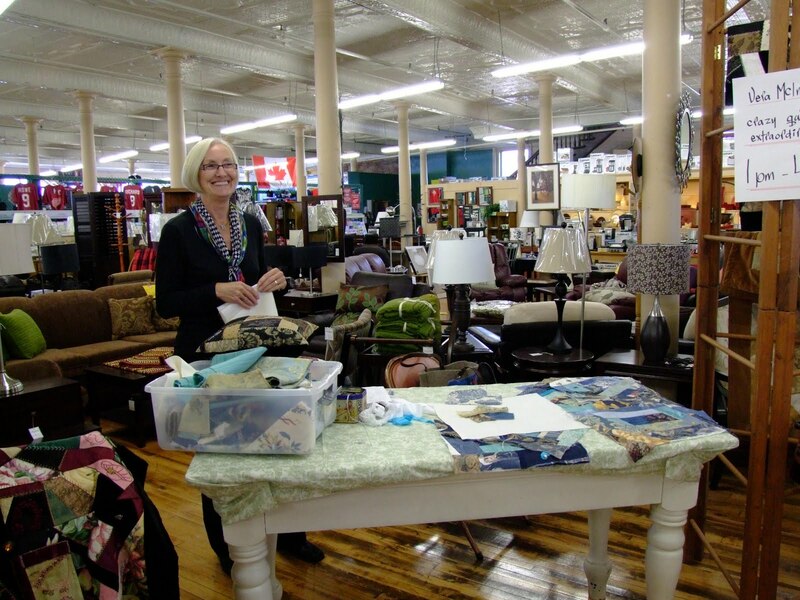 Amherst is a town of grand Victorian homes, one of which is owned by quilter Phyllis Cameron. 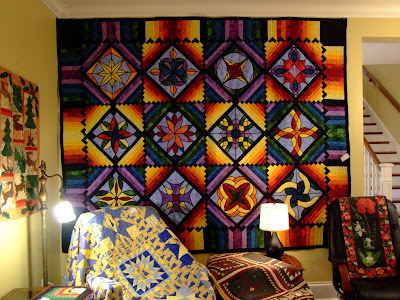 Each year during the Fibre Arts Festival, Phyllis opens her home to visitors to view her beautiful quilts. 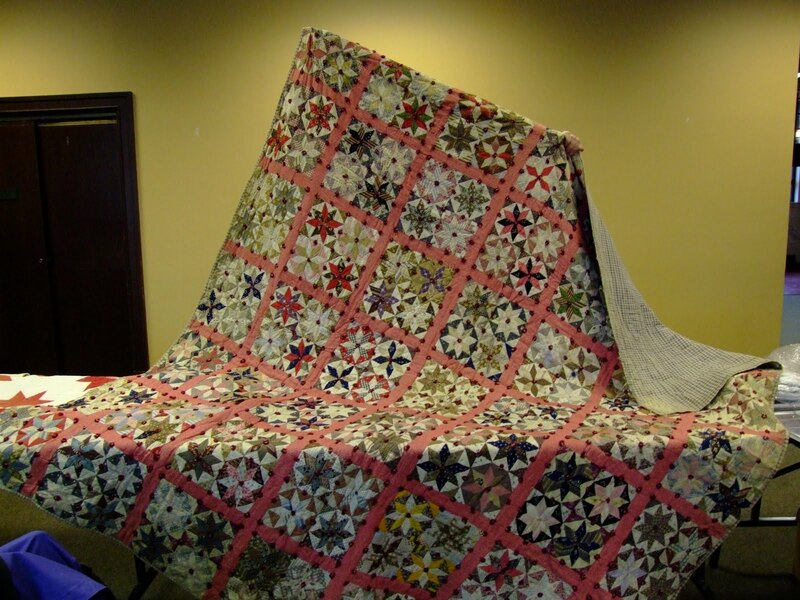 Included in the display are quilts stitched by other family members, including this one by Aunt Margaret. It was breathtaking to see the quilts in this beautifully decorated and restored home. Room after room was a visual delight. Thank you Phyllis for inviting us in. Saturday morning, Lynn and I dropped in on the Thrummed Mitten workshop led by Sally Austin. The wool was scattered on the table in a glorious burst of colour and the room was so quiet you could hear a pin drop. The knitters were concentrating very intently on getting their stitches correct so that the "thrum" or wool roving could be introduced into the pattern. Next year may see me join in with this group. Do you think I could thrum socks?! It was back to the Ralston Room bright and early Friday morning for another session on machine appliqué. We used my Meadow Song design as a jumping off point to learn the different ways a block could be appliquéd and embellished. We also learned a super simple way to make half square triangles, an easy trick to reduce the bulk in our pinwheel blocks and the secrets to stitching perfect circles. Participants came from both ends of Nova Scotia - Saulnierville to Antigonish - and beyond, including folks from New Brunswick, P.E.I and Ontario. It was a nice mix of sewing abilities and backgrounds all brought together through a common interest. 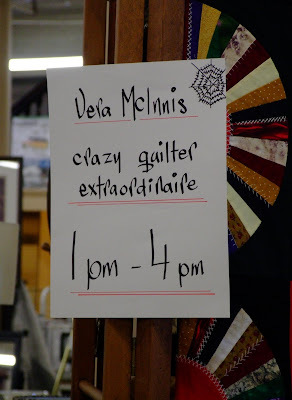 Because Friday was taken up for me in the presentation of this workshop, I missed two of the week's main events - the quilt show at the Baptist Church as well as the Zonta Bazaar at Tantramar Theatre. I heard both were spectacular. 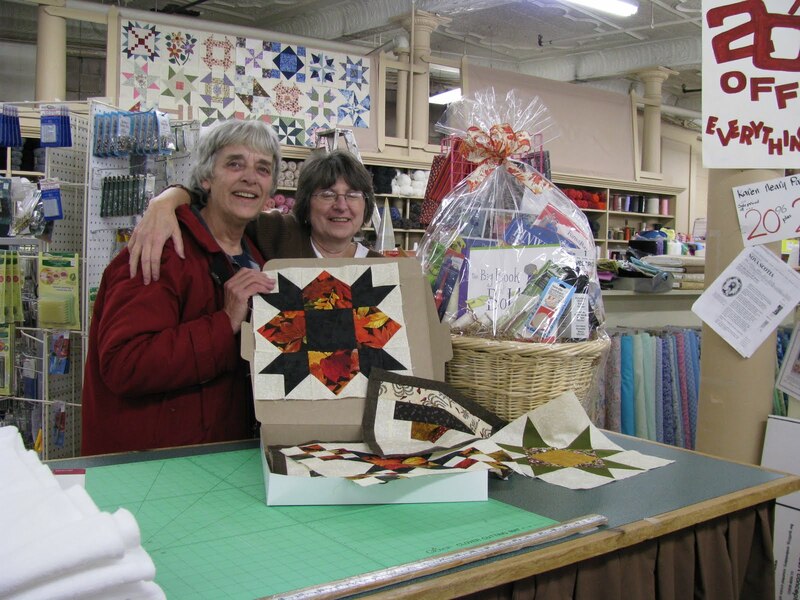 Dayle's Department Store was a busy spot during the Festival with their displays, quilt block contest, and fabric specials. 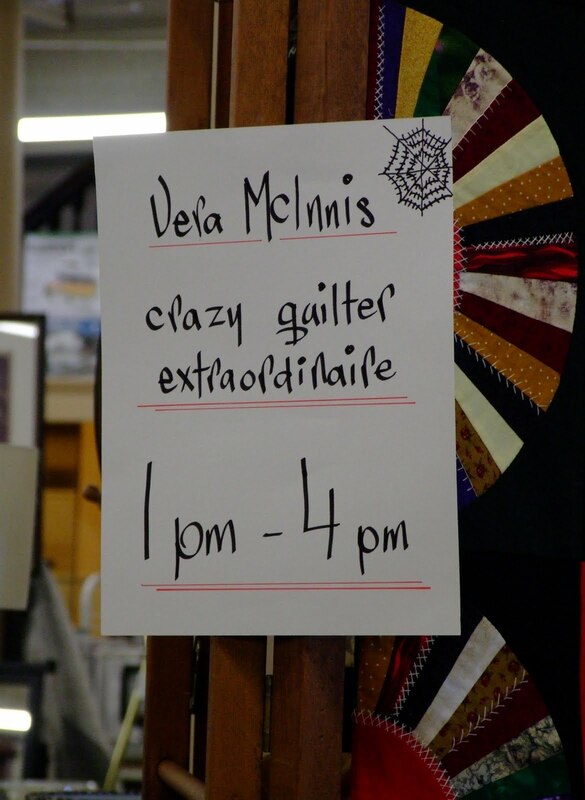 Vera McInnis was there Thursday afternoon to demonstrate how she stitches her "crazy quilts." 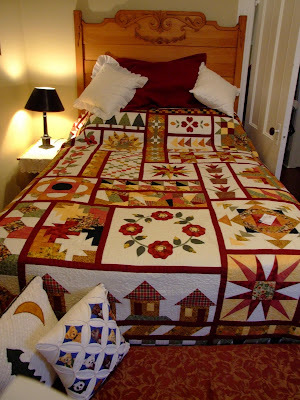 Her quilts are lovely and the stitching is all done by hand. This sign pretty much says it all!